RU Ready for Penn State Football? Rutgers did its best to hang in with Penn State, and even managed to make it to halftime behind by only 9 points. But Rutgers is a really bad football team. They have two wins on the season. Howard. And New Mexico. They have not won a Big Ten Game this season. They came close with a 34-32 loss to Minnesota. I’m not Penn State but Big Ten give me a win! Yet, the score was a god-awful 9-0 at the midway point. Penn State fumbled the opening kick-off. The Knights still could not score, as they missed a field goal. I’d have to check the stats (and quite frankly I am too lazy to do that right now) but that might have been the only time they started in PSU territory all night. But true to form, the lackluster first half performance was just a bland appetizer to the festive and delicious meal yet to come in the second half. Penn State pulled away while the defense shut down the Scarlet Knights and handed them their 4th shutout of the season. Special teams avenged their game opening fumble with a blocked punt in the third quarter. I almost felt sorry for the Rutgers players as the stadium was nearly empty by the middle of the fourth quarter. Granted, the weather was not pleasant, but still you would have thought some of their fans would hang in there until the end. I guess that makes them fair weather fans. Next Up: The Michigan State Spartans. Sparty almost upset the Buckeyes on senior day at home in East Lansing, but a questionable decision and subsequent play call to go for two with over four minutes to play in the game, left the Green and White a point short. They lost 17-16. Up north, the wolverines dispatched the annoying Hoosiers 20-10, but trailed Indiana 7-3 at the half. This sets up the season finale next week. If Michigan wins, they will go to the Big Ten Championship game. If Ohio State wins, and Penn State wins, the Nittany Lions will play in their first ever Big Ten Championship game in sunny Indianapolis, a prize package worth millions. Since UM and O$U face off at high noon, Penn State will know the outcome of that game by the time they kick off in Happy Valley at 3:30. The Spartans played the Buckeyes tough, but O$U has struggled on the road this year while dominating at home. The game against Harbaugh’s team will be in Columbus. Ohio State opened as an early 7 point favorite. Either way, PSU needs to take care of business on their own senior day. The Spartans have three wins (Furman, Notre Dame, and Rutgers.) When you’re marquee win is against Rutgers, it really puts your season in perspective. I think Penn State wins this game comfortably, but if UM beats O$U, it may take the wind out of our sails and work against us. But . . . an Ohio State victory? Beaver Stadium will be rocking! On behalf of Rutgers University and the Athletic Department, we would like to apologize for the regrettable actions of a handful of Rutgers fans on Saturday that do not convey the message of good, competitive spirit that we look forward to having with our new Big Ten rival Penn State University. Some of the signage and t-shirts that we have been made aware of were both inappropriate and offensive. I have spoken with and apologized to the Penn State athletic director Sandy Barbour and I would like to apologize equally to the Penn State University fans, as well as Rutgers fans that were subjected to this classless display that does not represent the ethos of our university, athletic department or fan base. The two inappropriate pictures that appeared briefly on our Facebook page as part of a 200-picture montage were immediately removed when we were alerted to their content. 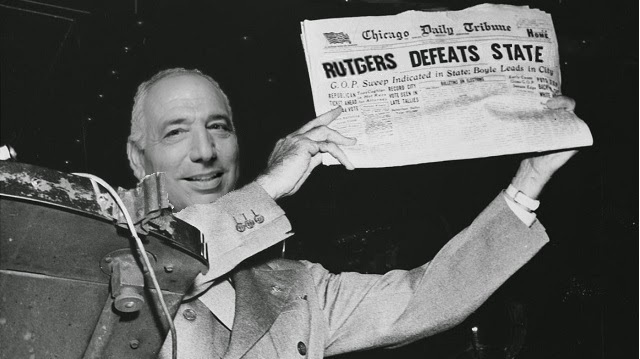 It is unfortunate that the actions of a few spoiled an otherwise historic and record-setting night that Rutgers fans provided for our first Big Ten football game. Sometimes there is a fine line between humor and insensitivity. 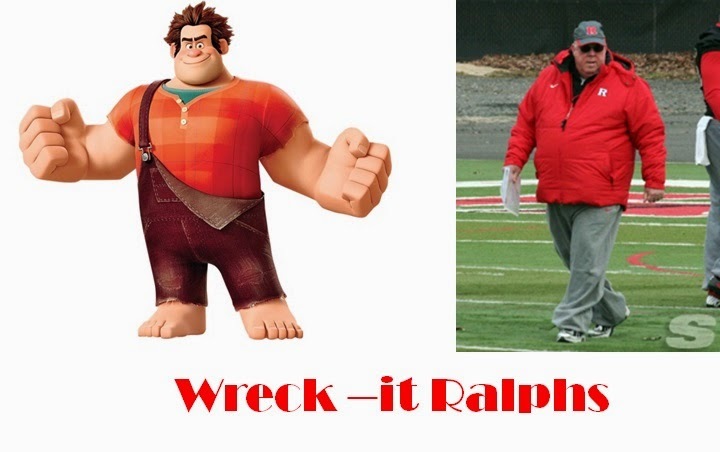 I think that some Rutgers fans crossed that line. But some think I cross the line sometimes. Oh, well. In a related story, New Jersey has renamed the town of Piscataway . 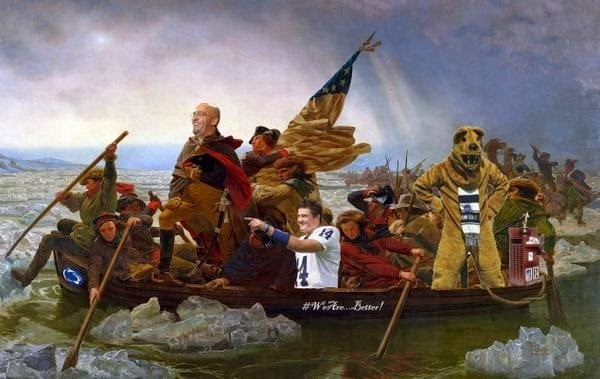 . .
And apparently, a picture of Franklin heading to New Jersey on a recruiting trip has surfaced . . .
We can only hope the Land Grant Trophy on the back falls in the river! Gary “turNova” threw five interceptions while the Penn State defense shut out the Scarlet Knights in the second half, to key a 13-10 win over our newest “rival.” This game is probably the most hyped, yet unimportant game outside of these two programs, that I have seen in a while. (The Ohio State-THEM game is the perennial over-hyped game which generally most other fans could care less about.) But I digress. Hackenberg passed for over 300 yards, setting a new school record of 7 games in his career of 300+ yards. Despite a 10 to nothing deficit at the half, this Penn State team did not give up. They may not have the best team. They may not have the biggest stars. We may not have the “best” coach. But this team gives 110% of itself for a full 60 minutes of every game. It would appear that Mr. Hackenberg operates best under pressure. And I’m not talking about defensive pressure, because he saw a lot of that in the first half from the Scarlet Knights. They were stunting, blitzing, and magically appearing in the backfield to help with the hand-off on nearly every down. Credit Penn State with making second half adjustments that allowed Hack to have more time. We still have an annoying problem. No running game. Yes, but that is not the annoying problem to which I allude. We seem to amass large quantities of yardage–mostly through the air, but fail to convert said yardage into points on the scoreboard. We are totally smashing the stats sheet (and the win column!!!!) but we can’t seem to light up the scoreboard. Granted, at 3-0, it’s an annoyance. But with BIGger prizes to play for now, it could become a real pain in the loss column later on. We can nitt-pick all day about having Hackenberg punt (did not work) and running the wild cat with Hackenberg out as a receiver (which hasn’t worked). Are we trying too hard to be gimmicky? I don’t know. I kind of like seeing new wrinkles. And with a little better execution, these plays could catch some people by surprise (such as the toss back to Hack at wide receiver for a pass.) Had we lost, well, then these things might be more important. But for now, they are just more nuances that other defenses have to prepare for. What was the deal with Witvoet’s mike? They didn’t replace it at half time. He looks like he’s a hundred years old. Maybe that’s his natural voice! And to his credit, he and his merry band of misfit zebras called a great game–perhaps the fairest game I have ever seen a Big Ten crew officiate. Okay, the two holding penalties that called back big plays annoyed me, but I have to admit, they were correct calls. Now, it’s not like holds like that always get called in our conference, but in the final analysis, they were correct calls. I’ve seen various estimates of the Penn State crowd (8-10,000) and one poster went so far as to guesstimate 25%. I think that’s a bit over the top, but it sounds like we were well represented. Post by Penn State Football. Sorry about that. WordPress won’t properly embed the video like Blogger. I will also give the Scarlet Knight fans some credit. They sold out their puny little stadium for this “rivalry.” And the game noise sounded loud and might have contributed to one false start penalty. I doubt Beaver Stadium would have been full had this game been played there on this weekend, but I could be wrong. But when your highest sell-out is still around what the other team pulls in for a spring scrimmage, I wouldn’t spend so much time crowing about it. That don’t impress me much! 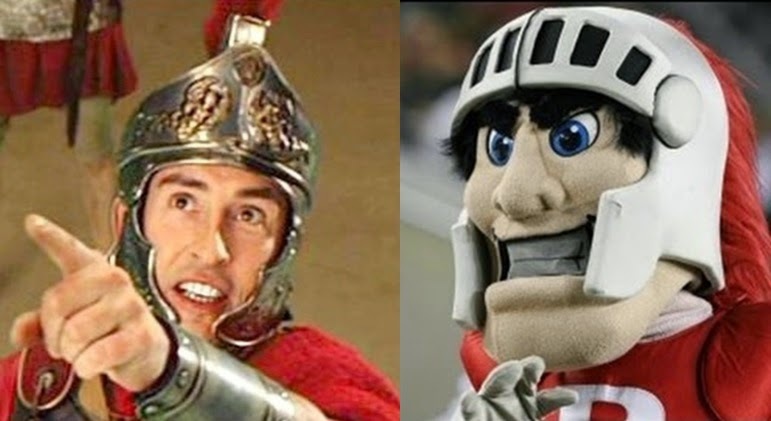 I will also give the Scarlet Knight players kudos. The emotion in the first half was unbelievable. You actually played hard enough to win. But in the end, emotion only carries you so far, and your best just wasn’t good enough. Some reports have trickled in about bad experiences from RU fans. These things will happen. Late start. Lotsa alcohol. Every fan base has their black sheep. People say things. People throw bags of urine. Whatever. But at the very heart of the matter, I understand your pain. You thought this was YOUR YEAR. Penn State is perhaps at it’s worst because of the residual of the sanctions. I saw this in the eyes of Temple fans two years ago when they came to Beaver Stadium in 2012 to face a struggling 1-2 Lion team led by new head coach Bill O’Brien. You (the opposition) have one of your better teams. It looks like the stars are aligning. Then it blasts apart in a super-gary-nova of interceptions and blown opportunities. And at the end of the knight, you are no closer to that Holy Grail than you ever were before. Oh well. Our third down conversions rate was about 50%, compared to about 33% for RU. The turn-overs are, without a doubt the key. Poor QB? Better D? I lean to the latter. Rutgers fans might disagree. Another interesting number– 1:13. UCF scored their go-ahead touchdown with 1:13 left on the clock. They ultimately lost. Penn State scored leaving 1:13 on the clock. Rutgers ultimately lost. Nothing special happened in the Akron game at 1:13. Penn State ran out the clock and ultimately won. Rutgers won the toss and deferred. Franklin is the first Penn State coach to go 3-0 in his first season since 1930. Penn State leads the all-time rivalry 23-2. PSU has never lost to Rutgers in New Jersey. Purdue lost to Notre Dame 30-14. Indiana lost to Bowling Green 45-42. Maryland lost on a last second, 47 yard field goal to West-By-God-Virginia, 40-37. Iowa lost their requisite non-com game to Iowa State 20-17. Minnesota was horn-frogged by TCU, 30-7. Washington embarrassed Illinois 44-19. Not really that hard to shame them, though. Urban Meyer made himself feel better by rolling up the score on Kent State, 66-0. He overcompensated his teams weakness by taking advantage of a team with greater weaknesses! Brilliant! Nebraska bull-dozed the Fresno Bulldogs 55-19. Wisconsin, Northwestern, and Michigan State were off this week. I heard Northwestern still lost. And oh look, Gary Nova just threw another interception! Through all games of September 13. Penn State and Nebraska are the only undefeated teams in the conference! 1. Georgia–is there ever a more over-rated SEC team year in and year out? 2. USC–lost to BC 37-31. 3. Hokies–after beating the Buckeyes, they fall to unranked East Carolina 28-21. 4. MD–last second loss on a long field goal. 5. Texas–lost to UCLA 20-17. They apparently screwed up the coin toss, giving UCLA opening possession in BOTH halves. The Minutemen are 0-3 coming off a loss to Vanderbilt, who scored 14 in the final quarter to pull out the win. Priorities: WIN! Work on the running game. Some reps for the back-up QB.